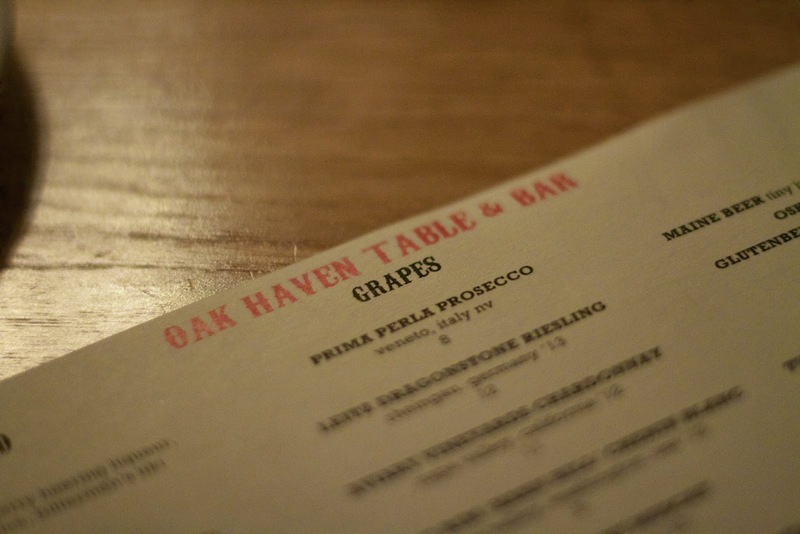 It's taken me forever to get to this review, which is crazy, since I'm really excited to spread the word about Oak Haven Table + Bar in New Haven. As you know, not all restaurants that say they support local food, actually follow through on that commitment. Lately, I have been experiencing a lot of half-hearted local sourcing by restaurants and I was becoming frustrated. All I can say is that Oak Haven Table + Bar has renewed my faith. They talk the talk and walk the walk ... and it's delicious. Craig Hotchkiss and Albert Greenwood opened Oak Haven with the mission of delivering the highest quality, fresh and seasonal ingredients in both modern creative and classical styles of cooking. When they hired chef Meg Fama she told them at the very beginning "if we're doing it, we're doing it for real." Chef Meg adjusts the menu around what is available from her farmers, not the other way around. To her, it's about making do with what you have and that "with enough creativity you can do it." She also preserves what she can to use in the bleak winter months - canning tomatoes, blanching and saving other vegetables. When a farmer grows something out of the ordinary and excitedly asks her if she wants it - she says yes and then figures out what to do with it. I don't think I could love her more. We were lucky enough to be invited with a group of fellow bloggers to check out Oak Haven. 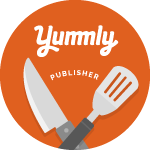 This afforded us the opportunity to get lots of insight into each dish. After every course, Chef Meg would come out of the kitchen to share what ingredients were local and what farms provided the bounty. It was easy to see her passion, excitement, and love of local ingredients. All the farms that Oak Haven uses are organic or in the process of being certified organic. The non-organic farms that they buy from do not use any sprays or chemicals. They have local sources for meat, seafood, produce, cheese, milk, butter, jams, honey and maple syrup. In fact, Gentle Giant Farm (formerly Ro-Jo Farms) in Bethany, CT plants and grows for Oak Haven. You can get the complete list of local sources on the Oak Haven website. Oak Haven is tucked into a small spot at 932 State Street in New Haven. As soon as you walk in the door, you're hit with an inviting vibe, like that of a speakeasy complete with a large dark wood bar. It's hip enough for younger folks but also is an easy fit for anyone who likes good cocktails and food. Artwork by local artists hangs on the walls, and even the chalkboard is drawn by a local artist. 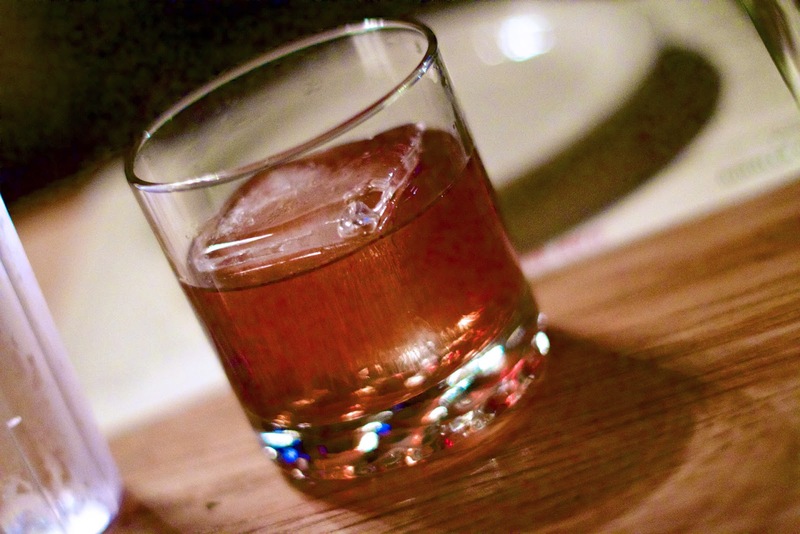 Matching the Prohibition era aura, Oak Haven mixes up a host of cocktails featuring bourbon and whiskey. Not sure which bourbon to try, just order a flight. Oak Haven makes three different ice cube shapes and will match the proper ice shape to the drink to ensure proper melting. For a few of the bourbon-based cocktails, Oak Haven will barrel age them to develop the flavors. They have a decent wine list, and for beer lovers, like myself, they have three local brews on tap as well as over 20 craft beers in the bottle. Instead of a cocktail, I went straight for a local beer. After reading a review by OmNomCT, I knew I had to choose Relic Brewing's (Plainville, CT) Demiana dark saison. It's good, really good. Now for the eats. The menu is broken down into Small, Medium, and Large Plates, Snacks, Cheese + Meat Boards, and Dessert. Many of the dishes change daily based on what's locally available. We sampled something from every category. Autumn Rolls - shredded market vegetable with a sweet plum sauce. 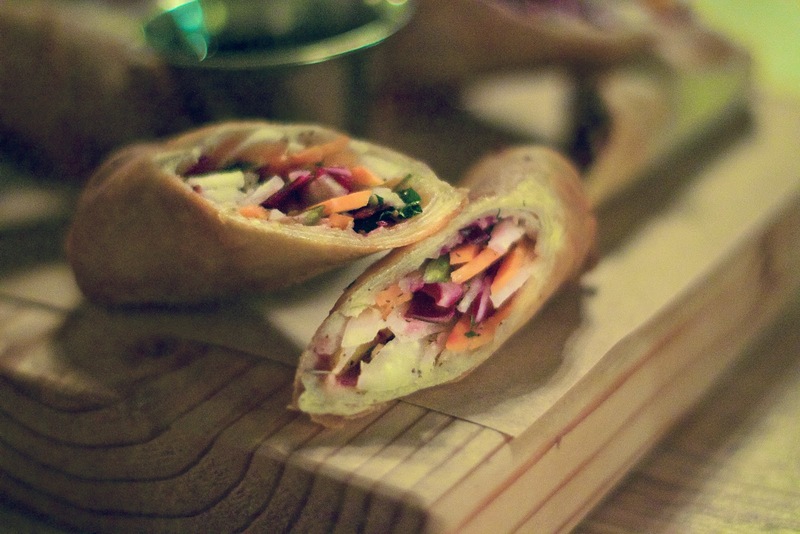 think of these as New England egg rolls. The lightly fried roll was filled with crunchy root vegetables. the sauce had a nice gingery kick. 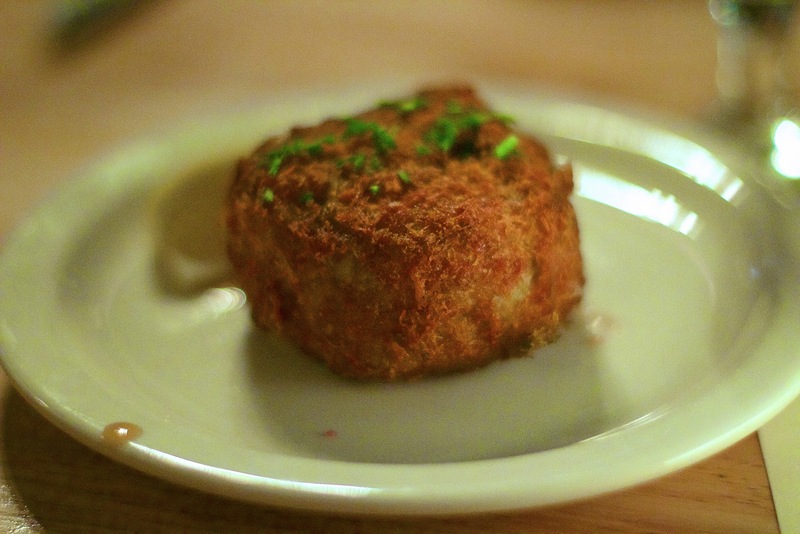 Blue Crab - dual crab cakes with a housemade remoulade. The outside of the crab cakes was coated in panko breadcrumbs lending a nice crispiness to reveal tons of tender crab. These were solid crab. They did not skimp at all. 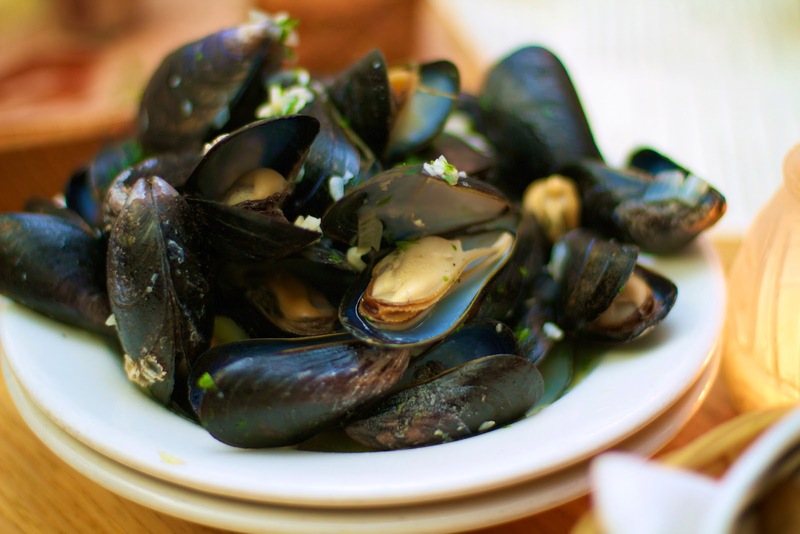 Mussels in beer broth with herbs and garlic served with housemade bread. These little pillowy guys packed a serious garlic punch. A little extra bread and I would have made this my meal. 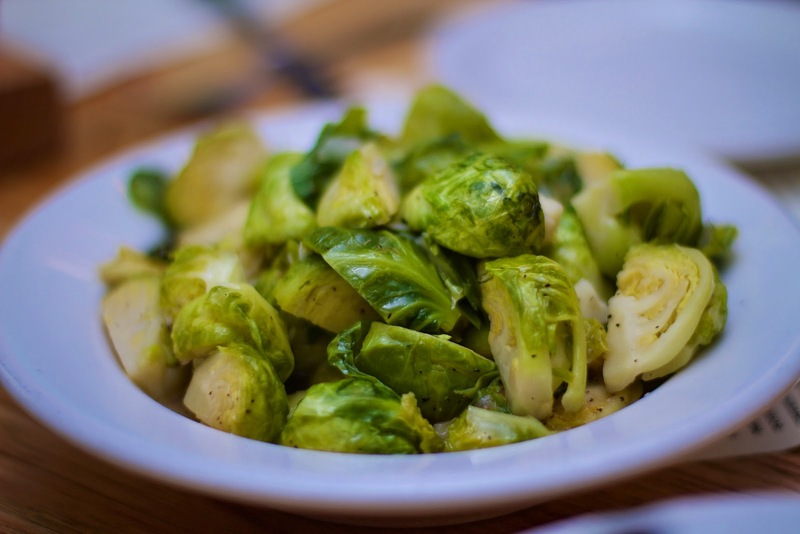 Brussels Sprouts with garlic and shallots in a maple reduction. These were good, but I would have little a little less sweet and a little more char in the sprouts. Renato loved them as is. He in fact took home the leftovers. Cassoulet with sausage, mushrooms, carrots, onions, local white bean, greens, parmesan in a wine broth. That night the cassoulet also featured some red curry squash, a somewhat less common winter squash. 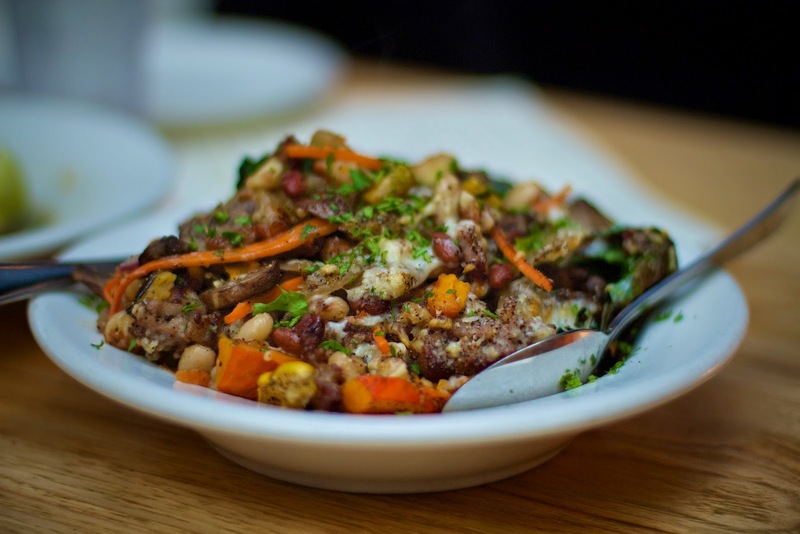 I loved cassoulet and this seasonal hearty spin on it was delicious. 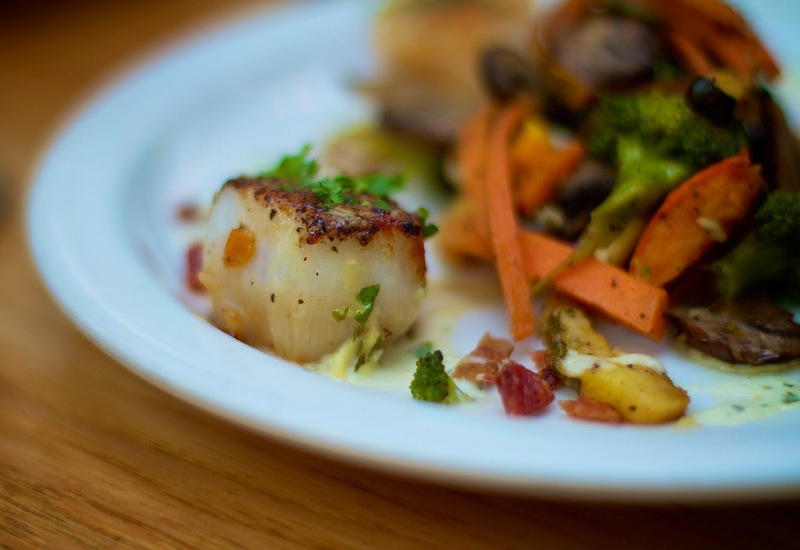 The Boat To Table aka fresh catch of the day was Scallops served with a tarragon cream sauce, bacon pieces and vegetables. With a gentle sear on the outside, they were tender and incredibly fresh. 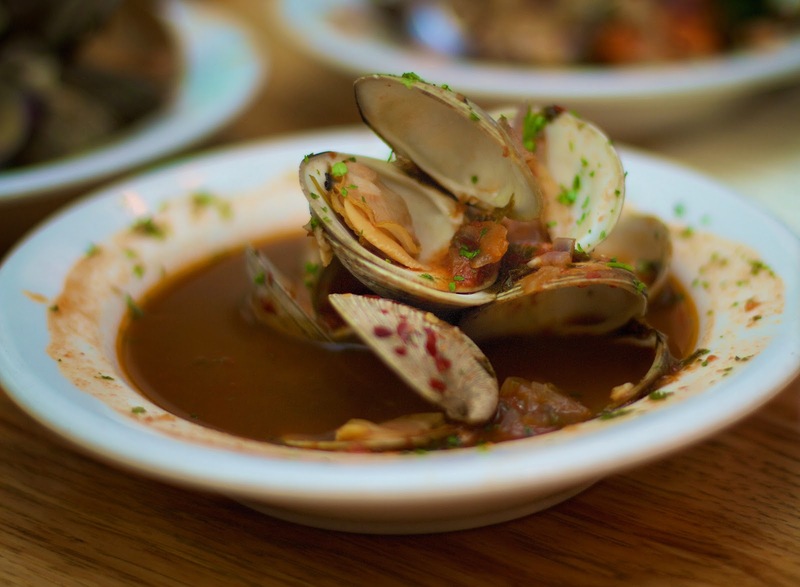 Not on the menu but when available we also tried the Clams Fra Diavola. The light tomato broth wasn't too spicy (others at our table would disagree), but it was very flavorful. And again, the bread was the perfect way to soak it up. I thought the clams were a little chewy, but I do have weird texture issues with clams, so it might just be me. 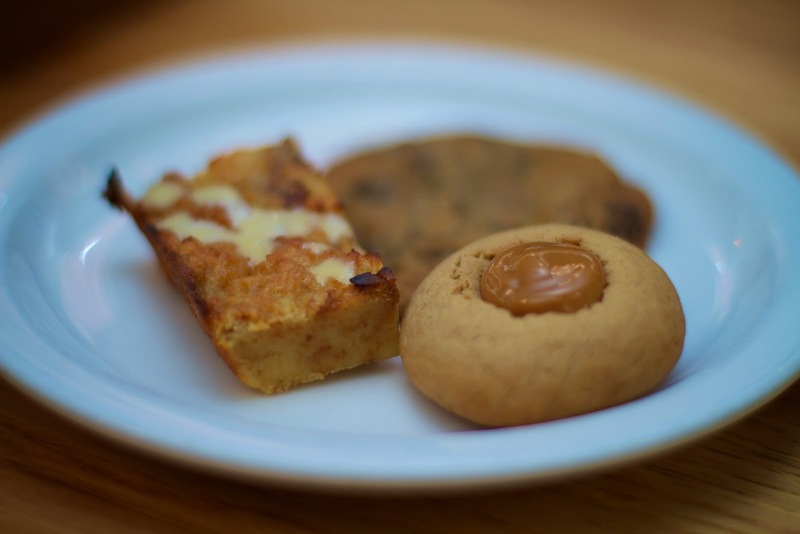 And as if that wasn't enough food, we sampled three desserts: Bourbon Bread Pudding, Strawberry Shortcake (made with strawberry jelly, not fresh berries), and a trio of cookies. The chocolate chip cookies were the big hit, but I was digging the bread pudding. It had a nice texture and wasn't too sweet. 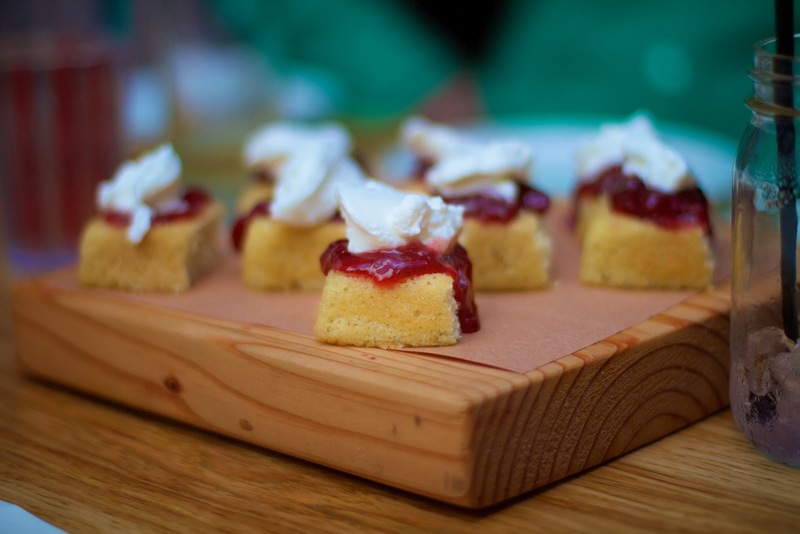 All I can say is you should add Oak Haven Table + Bar to your must try "farm-to-table" restaurant list. The menu is always in flux based on the season and available ingredients, so there is always something new to try... and that's a beautiful thing. Oak Haven is definitely succeeding in its mission to offer fresh, unique food and drink. Happy hour: Mon. - Fri. from 5 to 7pm. I enjoyed your review as I have eaten there many times. You really sampled a lot of the dishes! But why was the dinner free? Did they know you were reviewing them for your blog? The restaurant invited us along with a few fellow food bloggers for a complimentary tasting dinner so we could experience all they offer and write about it. Thank you so much for pointing out my embarrassing grammar mistake. I appreciate it. Loved Oak Haven - and I'm even happier that they're so close to me!. That cassoulet was amazing! I'm jealous you live so close! Hopefully Renato and I will get back there soon.